Many women dream of getting married, but those dreams don’t turn into ghostly propositions and offers to marry a dead man. Unfortunately for Li Lan, that is exactly what happens in The Ghost Bride. Li Lan’s father brings a marriage offer for his daughter. On its face, the offer seems to be a good one. Li Lan’s family faces a very uncertain financial future and has already been feeling the effects of heavy debt. And the offer comes from a prosperous family in the social circle of 1893 Malay. But the offer is for Li Lan to become a ghost bride – the wife of the family’s dead son, Lim Tian Ching. She refused outright, but the spirit of Lim Tian Ching is persistent, haunting Li Lan’s dreams night after night. I was fascinated. The story is written with a wonderful melody of magic, weaving together a family drama, a love story, and Chinese folklore. The scenes of visiting a medium and travelling to the Plains of the Dead, as well as the ideas of burning hell banknotes (to pay for commodities in the afterlife) and funeral offerings of food, servants, and houses captivated me. I couldn’t get enough of the story. But my appreciation is for more than the story alone; it’s also for the storyteller. Yangsze Choo is mesmerizing in her style. She uses language to create an all-encompassing scene. It’s like the thin filament that Fan, a spirit Li Lan meets, uses to stay tethered to her lover. And, like Fan would be by pressing the filament to her sleeping lover’s heart, we are transported to the mythical dream landscape that is The Ghost Bride. 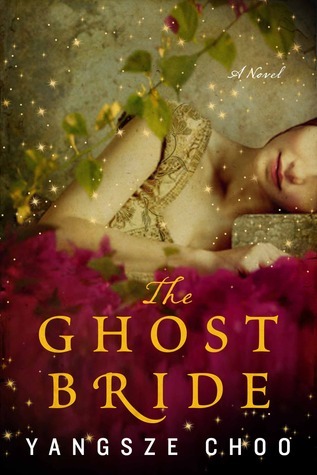 Many thanks to the Book Club Girl for the copy of The Ghost Bride. This sounds good! I love the cover.